To me, biting into a cherry tomatoe is like biting into summer itself! The last of our tomatoes are ripening now. 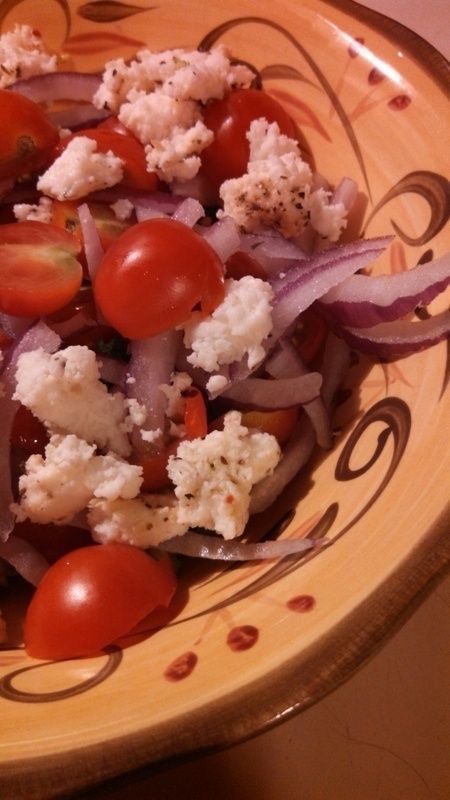 What better way to enjoy them than with red onions and a delicious goat cheese? I got the recipe for this cheese from a book given to me by a cherished friend. 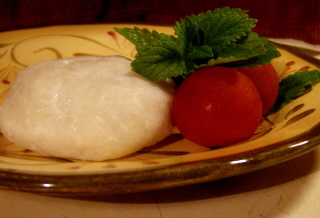 It is a mild, soft cheese that requires no aging. After forming, I rolled it in herbs de provence, wrapped it in olive oil soaked fig leaves, and allowed it to refridgerate overnight. Amazing flavor! And isn't this dish almost too pretty to eat? Hello all, Colton here again with our latest recipe using goat milk and milk products. Tonight my mom and I made homemade pepperoni, goat cheese and cheddar pan pizza. 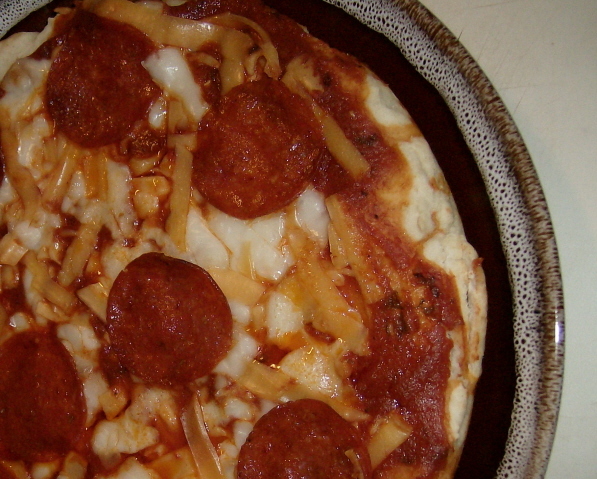 It was delicious...much fresher tasting than frozen pizza, and a lot less fat and preservatives than take-out. And less expensive, too! Hi all, Colton here again. Just had to post a quick note to say that sometimes, a presumed failure can turn out to be a great success! I must confess that I have a bit of a sweet tooth (as you might have guessed from my previous ice cream post). So when Mom suggested I help her make cappiccino yogurt from some of our goat milk, I was more than willing to help. We heated the milk to the appropriate temperature, added the required amount of live yogurt culture, and left the mixture in a warm environment to let it ripen. After the suggested time was up, we checked on the progress of our yogurt and found it to still be very thin. Now homemade yogurt is not expected to be as thick as the store-bought variety (they use gelatins to thicken theirs). Ours was really thin...not much thicker consistency than the beginning mixture. Not exactly sure why it didn't set well. Likely the yogurt culture we used was weak. But the smell was fantastic, so we decided to taste test. It was absolutely delicious! We popped a cup in the microwave to heat, and it was the tastiest cappiccino EVER! And healthy too! Look out Starbucks...we may be on to something here! Hello, I am Colton, the youngest human member of the James Hill Goats family. Today my mom and I made goat milk ice cream, and it was delicious! The recipe is from Mary Jane Toth's book, Goats Produce Too, volume 2. Really simple, only 4 ingredients. Definitely worth a try! This week I made the best bread pudding I have EVER eaten. It's a very simple recipe, and the taste and texture is perfect. I used some leftover sandwich bread that I had stored in the freezer, and added a small splash of pure vanilla extract to the original recipe. So good! I got the recipe from the book "Goats Produce Too!" by Mary Jane Toth. This is an excellent, informative book that covers most of the basics for those new to using goat milk in food preparation, cheesemaking and soapmaking. It is available from several resources, including Amazon and Hoegger Supply. 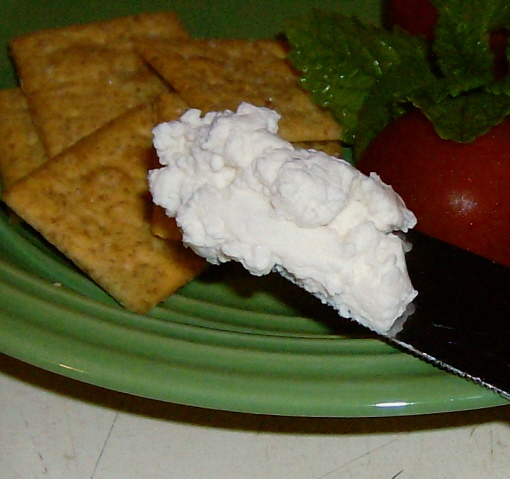 When we were done with the mozarella, we decided to make ricotta with the leftover whey (and a little added whole milk). It turned out great...very creamy and tasty. And super simple to make! We started putting Muffin outdoors in the doe pen at night, with her twins remaining inside in the kidding facility. I milk her first thing in the morning. I am getting 2-2 1/2 cups and not nearly milkng her out. Saving plenty for her babies! Even with her twins staying with her at night, Holly is milking 1 1/2 cups every morning. We should see a significant increase in her production when we start separating her from her babies at night. My husband asked what I am going to do with all that milk? Why, make cheese, of course! Colton and I tried our hand at two new recipes today for mozarella and ricotta. Of course his favorite to make was the mozarella as he got to pull and stretch it into shape. And it is delicious! Even though we had a chaotic day with Bunny's leg injury and emergency vet visit, we still managed to salvage the late afternoon for a more enjoyable endeavor. 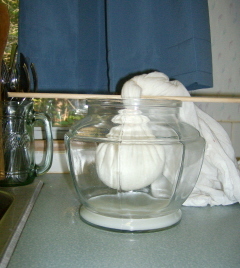 My son Colt and I made our first batch of homemade goat cheese together!